A wonderfully simple and unsophisticated camera, we sold lots of Trips during the time I worked as a retail assistant in Dixons from 1981 to 1983. Despite having no battery, the trip manages to offer programmed automatic and aperture priority metering modes – made easier because it had to choose between only 1/40th or 1/200th shutter speeds! The target customer for the Trip was the traveling holiday maker – people who wanted something compact, light and trouble free to take on their trips with them. 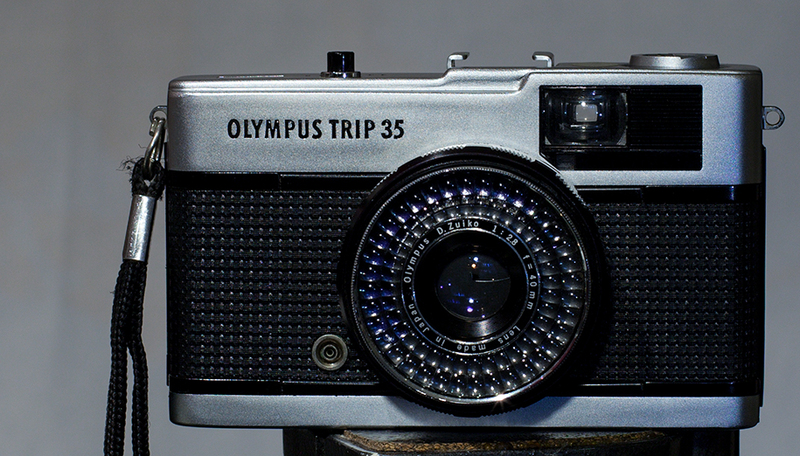 By the late ’60s air travel for vacations was becoming more accessible, and Olympus wanted to provide a camera for this burgeoning market. 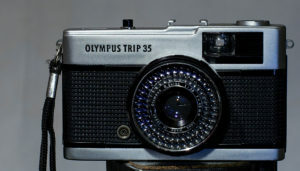 Truly a point and shoot camera, the Trip was intended to be used in “fully programmed automatic” mode, even though the phrase had hardly been coined at the time. The Selenium light meter required no batteries, and used an ingenious lever system to switch between the two available shutter speeds of 1/40th or 1/200th second. Within the lens the aperture by default is fully stopped down to f/22 until the shutter is partially depressed. The act of metering locks a moving meter needle in place, establishing the limit of travel for the aperture mechanism – there’s a cam lobe which moves as the aperture opens until it is stopped by the locked needle. 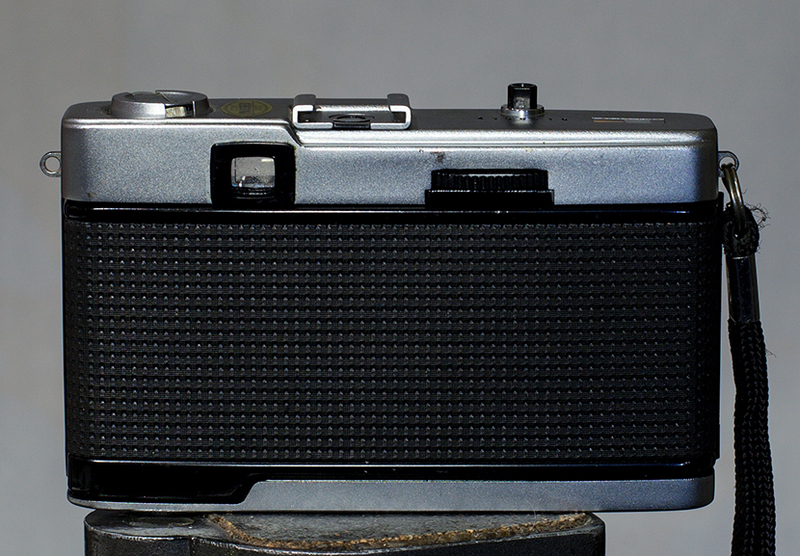 If light levels are too low, such that the internal (hidden) meter needle doesn’t move far enough, the act of depressing the shutter triggers a red flag in the viewfinder and an exposure is prevented. It’s very clever stuff! Focusing is via a very simple zone/symbol system, with pre-marked icons representing 1m, 1.5m, 3m and infinity. 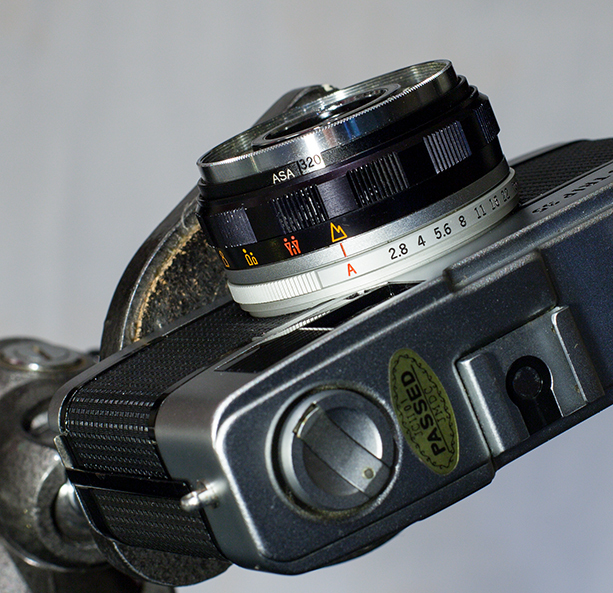 The 40mm f/2.8 is very sharp and provides a natural field of view for 35mm film. Ten million Trip 35’s were sold over a 17 year production run, and they were essentially unchanged from start to finish. Picture quality was actually pretty good, and everything about the camera was simple enough to encourage casual snap-shooters to fire away – to a degree that had not been as accessible previously. It’s the VW Beetle of compact cameras! Purchased December 2012 on eBay for $49. There are cheaper samples out there, but this seemed pretty clean and problem free.